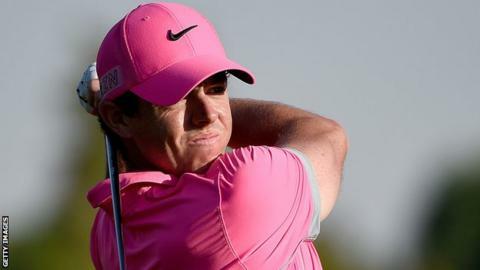 World number one Rory McIlroy fired a sublime eight-under 64 to move to the top of the leaderboard at the halfway stage of the Dubai Desert Classic. McIlroy carded eight birdies and missed several other chances as he took a one-shot lead over Scotland's Marc Warren. Warren led for much of the day after his 65 left him on 13 under but McIlroy finished with three straight birdies. Graeme McDowell and England's Seve Benson share third on 12 under with Lee Westwood among a group on 11 under. McDowell matched Warren's 65 with Benson carding a second successive 66 but the dominant feature on another glorious day of sunshine was McIlroy's magnificent ball-striking. The 25-year-old Northern Irishman reached the green with his drive on the 351-yard par-four second and picked up five shots in his opening 11 holes to move to 11 under. His momentum was then halted as he missed three successive short birdie-putts from the 12th but his mini-wobble was emphatically ended by three closing birdies, which included an 18-foot effort at the last. "I felt like I played very nicely. Couldn't ask for much more; bogey-free, made birdies, and set myself up for a good run over the next couple of days," said McIlroy of his round at the Emirates Club, where he recorded his first victory as a professional in 2009. McIlroy is scheduled to give evidence in the Dublin High Court over the next fortnight as he attempts to conclude his legal battle with his former management company but he looked totally focused on his golf on Friday. Warren stayed on target for a maiden Masters invitation as he moved into second with his nine-birdie 65 while McDowell dropped only one shot in only his second competitive round of 2015. English trio Westwood (68), Danny Willett (66) and Andy Sullivan (68) are in a five-strong group on on 11 under which also includes Scotland's Stephen Gallacher (67). Denmark's Morten Orum Madsen produced the lowest round of the week so far as his 63 moved him to 10 under with US Open champion Martin Kaymer two shots further back after a 69. Sergio Garcia was unable to undo the damage of his opening 75 as his 71 saw him missing the cut on two over while 2011 Open champion Darren Clarke (71) also exited as his level par total proved two shots too many.